Lifelong Eugenean Dale Berg was born in 1940, the same year that his father, Norwegian emigrant Alfred Berg, opened a Shell station on the corner of 13th and Lawrence. 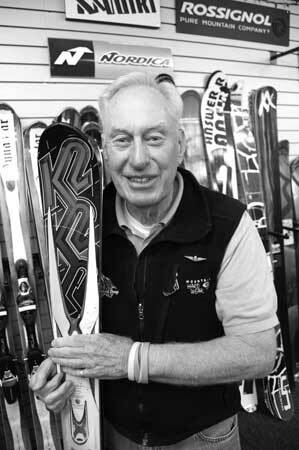 When he, his brother Paul, and his father took up skiing at Willamette Pass in 1955, the family opened Berg's Ski Shop next door to the station. His brother and shop co-owner Paul died last winter at the age of 67. "I worked there evenings and weekends in high school," says Berg. "We shut down and went to Norway in the summer." Now, 56 years later, Berg still works at the shop, as does Svein, one of his four sons, and he still visits Norway every summer. "I've seen generations in families come through the doors with smiles on their faces," he says. "The best part of this business is helping families have fun together." Also known as "The Man About Town" on KUGN Radio at 7:20 am, Berg takes an active volunteer role in many community activities, from timing the finish line at UO track meets to boating safety checks for the Coast Guard (he previously served in the CG Reserves). He stays in shape with daily morning workouts at the DAC and weekly ski outings in season on the Wednesday Hookey Bus to Mt Bachelor. "I have my Norwegian cousins on the speed-dial," he says. "I'm on the phone with them all the time."